SOLD! In less than one day on the market…..Brian was true to his word. His assessment of the current market conditions was bang on and he was able to quickly create a strategy that delivered. I appreciated the fact that he listened to my goals and my circumstances and took time out of his weekend to come to the house along with Cherie his partner and wife to assist. They both made excellent recommendations as to how to make the house present the best and even assisted with moving a few things around. In the end, the process unfolded exactly as he predicted. Don’t hesitate…if you’re looking for an agent, call Brian… he delivers honest results. Thanks so much Brian and Cherie!!! I cannot thank you enough Brian for selling my house. You are the complete package! Your wonderful approach with people along with your humour, wit and professionalism….I knew I was in great hands. Your honesty and fairness is incredible. If anyone is thinking of buying or selling your house…contact this man!! Brian Morrison he will get the job done…and Fast!!! Woohoo!!!!!!! Janet and I have now used Brian three times to buy and sell houses for us. Brian has an incredible talent to assess the market and work with us, to establish prices that met our expectations. We quickly learned to listen to Brian’s advice with respect to the market and what we needed to do to best present our house. We continue to be impressed with his knowledge and honesty… thanks again Brian. I’ve known Brian for many years. My first real introduction to him was when my wife and I were looking for our first home. Brian was the third realtor we had been to. In a hot market at the time you couldn’t get a home unless you were there quick. He got us to homes that were just hitting the market. He was patient and not in a rush to sell us any old house even under these conditions. 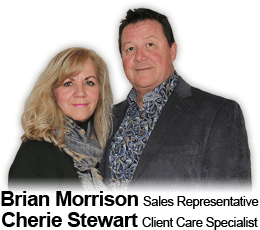 There were a number of homes that we would have seriously considered that Brian steered us away from, he is well informed about the homes and areas in and around the Kingston market… Our budget was tight and we were still treated with the upmost respect. Over the years I have referred many people in the direction of Brian’s services. Not one time have I had anyone say something negative. I hear descriptors like, professionalism, knowledgeable, thorough. Nothing gets taken for granted with Brian and that shows in how he treats his customers and his thoroughness with every part of a deal, offer through completion. I would and do confidently recommend Brian. As first time home buyers, Brian made the whole process effortless for us. He ensured that we only visited houses that met our needs and parameters. We greatly appreciated his guidance during visits where he pointed out any features that might be problematic for us in the future. Thanks to Brian, we now have a residence that we truly enjoy. I wholeheartedly recommend Brian Morrison for his reliability, expertise and proficiency. I’ve been involved with Mr. Morrison in numerous real estate matters since 2006. I know from experience that he can always be depended upon to provide the best response to any inquiry, request or emergency. He has repeatedly demonstrated his commitment to the highest standards of professionalism. I can’t imagine anyone having more practical knowledge of his area of operation. If Brian doesn’t already know the best answers to your questions, he will find them and get them to you in the most timely manner. For example, i had issues with properties in Belize, Central America. I was frustrated in every attempt to resolve them. Even though he has no connections there, I knew I could count on him for guidance and assistance. In less than two days Brian provided a solution to the problems I’d spent months trying to resolve. i feel most fortunate to have Brian Morrison working on my behalf. We have know Brian Morrison for about 20 years. In the pass years, we have had a few real estate dealings with him and found him to be true to his word. We found that his appraisals were fair price value or above others. He worked hard to sell our properties in the pass and in a reasonable time frame. We have no doubt that he is a well qualified person for the job. We would look forward in using him again in the future. Choosing Brian Morrison, as the Real Estate Agent for our recent home sale, was the best decision we could have made. Having moved from coast-to-coast and experienced seven home purchases and sales over the years, we know what a difference it can make to have a skilled real estate professional on our side. Brian provided outstanding service and enabled us to secure a sale over and above what we thought possible and in record time. His extensive knowledge of the local housing market, connections within the Realtor and business communities, and strong negotiating skills , puts him in a league of his own! It is without hesitation that we would contact Brian for future real estate needs and only wish we would have known him sooner. I am happy to recommend Brian Morrison to anyone buying or selling their home. I first met Brian a number of years earlier when my son was buying his first home. Brian was recommended to me through someone at work. In May 2016 my home had been on the market for 7 months at which point i changed realtors to Brian about the first of June 2016. Brian appeared at 8am the next day, took pictures, and said it would be up on line by noon – i believe it was a Friday. I immediately had several showings with repeats over the weekend . This action continued , the house had an offer by the end of June, sold about the 4th of July, and closed on July 29th. I recall him working as hard finding my son his first home years earlier. I had this home built and i had been in it for 43 years. Brian seemed to understand it is a stressful process and his calm, take charge manner was helpful and got it done. It has been an adventure for sure as we sold our home in Belleville and relocated to lake country north of Kingston. Working with you as our agent both on the sale of our Belleville home, and on our new purchase has been a great experience. My wife and I have enjoyed working with you ever since we met several months ago at Loughborough Lake. You have provided us great value in a number of areas, including your automated updates to us on new properties that were coming on the market, your comprehensive and timely communications, your amazing response time when we had questions, your willingness to go the extra mile when we needed support , and your sage advice. it is obvious you have been in the game for a long time and you have paid close attention to what works and what doesn’t work. We never saw you rattled, and you always worked with us to find a good solution, even when we encountered some weird and wonderful situations along the way. Brian, we are now happy in our new home. We love the place you helped us to find, and we know that this is an ideal home for us now, and will be a perfect retirement home for us once we hit that stage. We will be recommending you highly to others we meet who are looking for a change. Brian has been our realtor for over 20 years , and during that time we have bought and sold many houses. It has always been a positive and worry-free process. Brian possesses a thorough knowledge of current markets, he provides prompt responses to our requests, and he exhibits excellent negotiating skills. he is very detail oriented and always professional. We would highly recommend Brian for all your real estate needs. We have purchased and sold two homes with Brian, and would do so again without hesitation! As a military family, we seek a personal , prompt and professional service. His wealth of experience, market knowledge and vast professional network are second to none – ensuring the best possible service. His care for his clientele, his tireless efforts and personal touch have made each move an extremely pleasant experience. He is focused on customer service above all else and strives to meet his clients’ needs, whatever they may be. He is in our opinion head and shoulders above the competition and the obvious choice for realtor services in the Kingston region.